Crabtree remains unsigned, Jeff Zrebiec of The Athletic reports. Crabtree was informed of his release Monday, Adam Schefter of ESPN reports. Crabtree may be released during the offseason, Jeff Zrebiec of The Athletic reports. 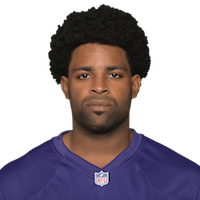 Crabtree brought in two of four targets for 38 yards and two touchdowns in the Ravens' 23-17 wild-card loss to the Chargers on Sunday. 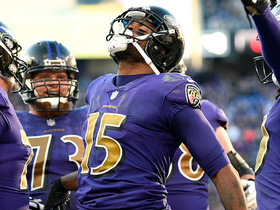 Crabtree caught 54 of 100 targets for 607 yards and three touchdowns in his first season in Baltimore. Crabtree caught one pass (four targets) for 20 yards in Saturday's 22-10 win over the Chargers. 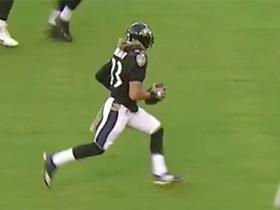 Crabtree failed to bring in his only target in the Ravens' 20-12 win over the Buccaneers on Sunday. Analysis: Crabtree was shut out of the stat sheet altogether for the first time this season, with his blanking particularly ill'timed considering it came in the heart of the fantasy postseason. Crabtree had actually shown better chemistry with rookie quarterback Lamar Jackson than fellow wideout John Brown, as he'd notched a trio of grabs in each of the prior three games. 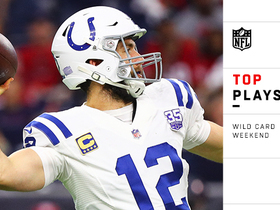 He'll look to bounce back from the forgettable outing against the Chargers in a Week 16 Saturday night matchup. 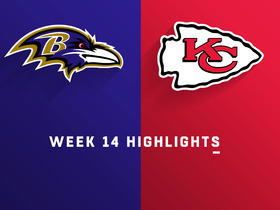 Crabtree caught three of four targets for 31 yards in Sunday's 27-24 overtime loss to the Chiefs. Analysis: Crabtree moved the chains a few times with nice catches along the sideline, but he also had an offensive pass interference penalty that stalled a drive in the fourth quarter. He's largely been limited to run blocking since Lamar Jackson (ankle) took over at quarterback, averaging 2.5 catches for 23.8 yards the past four weeks. A friendly Week 15 matchup probably won't make much difference unless Joe Flacco (hip) ends up getting the start. Crabtree caught three of four targets for 36 yards during Sunday's 26-16 win over the Falcons. 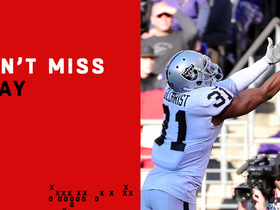 Crabtree caught three of six targets for 21 yards and a touchdown during Sunday's 34-17 win over Oakland. Crabtree converted his three targets into a 7-yard catch during Sunday's 24-21 win over the Bengals. Crabtree caught three of seven targets for 32 yards in Sunday's 23-16 loss to the Steelers. Analysis: Pittsburgh has had Crabtree's number this year, as he managed only three catches for a season-low 29 yards against the Steelers in Week 4. 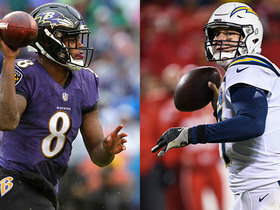 Luckily for Crabtree's owners, these AFC North rivals won't meet again this season barring a possible playoff matchup. 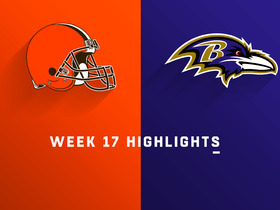 After scoring at least eight touchdowns in each of the previous three seasons, the veteran wide receiver heads into Baltimore's Week 10 bye having made just two trips to the end zone. 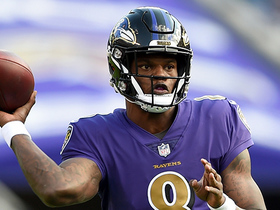 Baltimore Ravens quarterback Lamar Jackson hits his wide receiver Michael Crabtree for 20 yards. 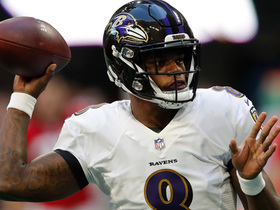 The Oakland Raiders deny the Baltimore Ravens quarterback Lamar Jackson with a volleyball interception. 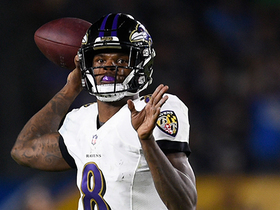 Baltimore Ravens rookie quarterback Lamar Jackson finds Michael Crabtree for the first catch of the game.